This is an all in one system so simple to use and fantastic sound, choose your package 2 or 4 speakers wired or wireless microphones. It has all the features you need for assemblies, plays, performances, parties, even cinema nights. 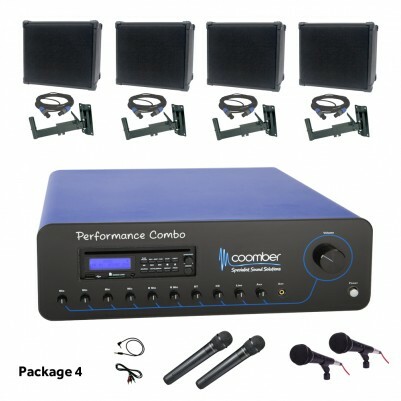 Everything you need in one package: Includes Bluetooth, CD player USB & SD card player, laptop & iPod connections, microphones, amplifiers to speakers, 10 dual channel mixer, supplied with Speakers, wall brackets, speaker cables, power leads, iPod and laptop cables and microphones. So no need to buy anything more! Plug & play straight out of the box. If you need a big sound for any hall, the Performance Combo will not let you down. Main unit available separately please call the office for compatibility to your existing speakers. Turn on your superpowers for the next performance! The Performance Combo is the hall sound system built for big performances. It has all the necessary ingredients to give you the power and quality you can always count on. The amplifier works seamlessly with the speakers and the microphones to complement the performers and impress your audience. You can forget about dull performances. The bold sound will boost self-confidence and energise the entire room. School performances will never be the same! Whether you’re an experienced technician or a complete novice, you will find it equally refreshing using a professional sound system that works without fuss. Once you’ve decided what the audio source will be (CD, USB, your smartphone via Bluetooth or microphones), all you have to do is turn the volume levels up, press play and let the magic begin. A school hall sound system you can trust is a priceless possession. Think of the hours you will save not worrying about your sound system and focusing instead on your students. It has been our goal as a company to provide teachers with quality audio products that are easy to use and reliable at the same time. Our hall sound systems are made in our factory in Worcester, UK and we are always one phone call away to answer all your questions. Not ready to place your order yet? That's okay. We are happy to discuss your school's individual needs and give you a personalised quote. Feel free to give us a call on 01905 342 070 or click here to send us your enquiry. "We have tried to cut corners in the past and although Coomber products are not the cheapest, it is most definitely worth paying the extra.